If you have a young family, custom home builders in Calgary can create features that make your new house both fun and safe for your kids. Get creative! When you’re building a custom home, there’s no need to limit yourself to conventional ideas. If you can dream it, Fine Line Homes can build it. A rooftop play deck. If you opt for a flat roof design, you can double up your available play space by transforming the roof into a playground. Just be sure to include safety fencing around the perimeter and choose a roofing material that won’t leak energy. Colour-in wallpaper. It’s a real-life nightmare that thousands of parents have come home to: a kid who’s coloured all over the walls with markers or crayons. Forward-thinking interior design companies came up with a fantastic solution: wallpaper that’s actually designed to be coloured in. This kind of wallpaper usually comes with abstract patterns that kids can liven up with markers, crayons, coloured pencils or paint. Ball pits. If you’ve got some space to spare, why not designate a small room to fill with multicoloured plastic balls? Consider yourself warned: it’s an inexpensive way to make your home the most popular one on the block with the neighbourhood kids. Indoor climbing walls. 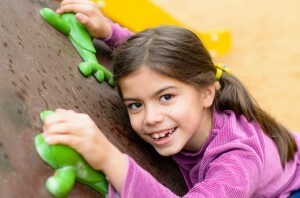 One of the most budget-friendly, kid-friendly ideas out there is to create your very own indoor climbing gym. For about a dollar a pop, you can purchase indoor wall holds that will give your kids and their friends endless hours of entertainment. Just be sure to pad the floors in case someone takes a tumble. Backyard mini golf. If you’ve got a generously sized lot, or if you’re building on an acreage, custom home builders in Calgary can create a backyard mini golf course. Don’t tell the kids, but you and your partner may have just as much fun with this one as they do. Take toy trains to a whole new level. If you’re looking for a unique way to add a little decorative flair to your playroom, why not create an electric train course that runs around the upper portion of the walls? If you really want to go the extra mile, you can add all sorts of features and obstacles, from tunnels and bridges to hills and dips. Indoor swings. As all Calgarians know, summer is far too short. One of the best ways to overcome seasonal limitations is to suspend an indoor swing from the ceiling — it’s safe, low-maintenance and very inexpensive. Themed playhouses. Indoors and out, playhouses are always a hit with kids. Make yours unique by choosing a theme; pirate ships, haunted houses and fairy tale-inspired play spaces are just a few of the endless options out there. Of course, you may prefer the conventional route, and there are some kid-friendly home features that never go out of style. Indoor playrooms are always a hit with children; just be sure to include plenty of storage space so your kids have no excuses for not cleaning up! Backyard trampolines, hopscotch gardens, and arts and crafts areas are also timeless outlets for youthful energy and creativity. Fine Line Homes is one of the leading custom home builders in Calgary, using a unique and proven homebuilding system to help people in southern Alberta realize their lifestyle dreams for a price they can afford. No matter what kind of vision you have for your new home, we can help you realize it for less than you might expect. For inspiration, check out our custom home gallery; if you have questions, or if you’d like to learn more, please don’t hesitate to contact us.